Anyway, good news is that I've been spilling some paint on them, so I have the whole group from that KS; besides, I added Barnacle Ben to the lot from a later KS. I thought the mini totally fits in the group, couldn't resist to that. You didn't expect these colours? Everyone in Necromunda wears them this season! You can see I've favoured bright colours and I've consciously avoided dull patterns. I wanted them to stand out, to somehow break the FIW appearance, but with no conversions on them. My idea for them is to represent a nomad tribe of the wastelands, wandering from here to there, through the ash deserts, the contaminated promethium pump complexes, the upper wild mountains and of course the perilous underhive. Well, they surely make a wild bunch of rough badasses. Painting them has been quite easy going; I've enjoyed painting different patterns on the clothes and going to unexpected places with the approach I was aiming for them. 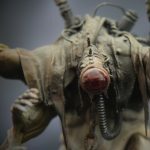 The creator, Paul, is a true gentleman whose enthusiasm knows no boundaries; in fact he has been regularly expanding the ranges with different kickstarter campaigns, so now Blind Beggar Miniatures is quite a place to have into consideration. I had to restrict myself as the lead mountain is kind of imposing right now and I don't really want to compromise my schedule for the next couple of years with unpainted minis -at least until I manage to get more stuff done! My RT board flows with people again. Yet more to come! Not much to say, we are still in the High Farseer's reflections, his off-screen voice lamenting the things that have happened and the things that are to come. In between we can see the Blood Angels, so you may imagine that they will have some role in the story. Well, the story resumes, so what can I say? Onwards! To adventure! I'll be bringing new pages soon! EDIT: Here's the raw material. The interesting thing is not just the cube shaped box, but the holes on the top, allowing me to play with volumes, tubes, chimneys or whatever. Of course a mere piece of cardboard will make it, but I was lucky enough to have that work done! Let's go on some of the details. The laundry at the first one is made of actual cloth, the same old piece I use for drying the brushes and so. I simply cut some little custom pieces and painted over. The well is nothing but a spare piece from a tap, which I kept after some home repairs. The flower pots are made with little pieces and bristles from an old brush. The garden table is just the spare button you get when you buy new trousers. They are super easy to make, and provide some triviality, some prosaism, to my board. Just regular houses where normal people lives. In WH40K terms that may be not much, but I'm not disserting about social status right now, ahem. Best thing of all is that they are so easily stackable! There we go again! I'm having some busy days, but I'll try to get back to routine with the comic. First thing is that I have no cover for Volume 2 :/ I prefer doing covers when the whole thing is done, so I can find a better and accurate composition with the actual content instead of my previous expectations of what I'm about to draw. But I had an introductory text, just in the same fashion of the one for Vol. 1, some kind of metanarrative to get the reader in context. So, with no more mumblings, I leave you with that text and the first pages of Vol. 2. There we go! Treating the Wars of the Hammer as an unitary, single event would be of course a mistake. The wars took place in enormously distant places, and very different characters had their role in them, giving shape to a series of events in which one cannot see an unifying thread in many occasions. It is for sure the presence of Beronis what gives coherence to the overall scheme [...] Though Historicus Allan Baalzenbergis includes the naval battle over Lausor between the Imperial Fleet and the Tau Navy as the first of the encounters that conform the Wars of the Hammer, and he does so with relevant arguments, it would look more prudent (and there is more consensus on it) to consider that the triggering events of all that happened later were unleashed on Itabirion [...]. As you can see, the introductory text serves as a link between both Volumes. It provides a plausible explanation to the question of how the hell is it possible for a damn mausoleum to exist on the surface of an Imperial planet since the times of the Great Crusade without nobody knowing. Anyway, what's done is done. The double splash in pages 2-3 serves the same purpose that the hive city in Vol. 1, a striking image to make you feel small (You know, the universe is a big place and, whatever happens, you will not be missed and all that stuff). Scale is a thing in Warhammer 40,000, I guess. We begin with a flashback of the memories of the High Farseer Ellinderelion. My intention for each volume in the series was to always begin them with an oniric element. The first one was a nightmare, this was a flashback. Next one would have been a divination (using the Imperial Tarot, a long time lore reference but totally underrepresented item; I was even on the process of designing the whole deck). I also had a performance of the Eldar myths by the Harlequin troupe, maybe the story of the Dark Angels told in a flashback as a new member enters the Inner Circle, a Blood Angel succumbing to the Red Thirst... all of them with some touches of my own, in the way you have already seen before. I digress. The relevant thing about this flashback is the casting of Eldar Seer Stones, something I had always wanted to represent in a comic since I first read that story from the 2nd Ed Rulebook (I guess it may had been published somewhere earlier, but that's the first time I saw it and got me totally hooked). I used some of the same stones that appear there and I made up some others. It all serves the purpose of focusing our attention on the story since the beginning and giving us some perspective from the Eldar side, as they have a main role in all the things to happen. Ellinderelion will be the lead first person narrator in this chapter, just as Brent was in Vol. 1. Not much else for today, let's just see how this unfolds. I got up to 30 pages of Vol. 2, plus page #31, which is just the pencils. I'll be scanning and preparing them all until I run out of them. I hope you enjoy them! I had the idea of a tiny market for my urban board for quite a long time in my head, but it hasn't been until now that I've been able to turn it into a real thing. My most obvious choice were the stands by Micro Art, from their Wolsung range, which are lovely. I started with the big one. I converted it into a spice market/food vendor stand. I used some greenstuff to represent mounds of spice into the boxes provided, and also sculpted some exotic or alien vegetables and stuff. You may remember that, for more forbidden stolen specialised gear, you may want to visit Mama Balaklava's, a fine place for the gentle adventurer who would like to avoid undesired Imperial entanglements. This is more a modest place, but also serves its purpose. The final touch. I got these jars from Fenris Games. Sweet pieces that fit in the market theme but that can also be used for other settings. Now I need crates and stuff! So we have Brent on the run and the Eldar on their way to rampage a human settlement so the Imperium has to divert troops and leave this flank unprotected. Machiavellian! This was meant to be chapter one in a series of eight. So now the pieces are deployed and the game starts! Dun dun dunnnn!! From: Corporal Niklas Arasac. Intel Section. 45 Belrive Inf. After the events told in my latest report, I can now offer clear results. Following the subject V. Prienne has finally led to the whereabouts of the subject B. Beronis. Apparently, after the Gavarnus affair they seem to have acted teaming up. An irregular team, but leaving enough trails to trace them. 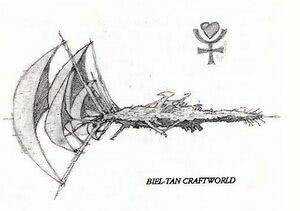 It looks like, for the last two years, they have been operating in the hive city of Besenval, planet Lausor (Mieris system, Mauclar subsector, Eubea sector, Ultima Segmentum). The possibilities for hiding in a hive city are obvious, as well as the chances of making a living in their fugitive status. Investigation has found several setbacks, as the subject is skilful erasing his trails. Close observation has not been possible, but it looks like he has made his face scar disappear, which suggests specific medical treatment. No information can be retrieved about other body scars. Such an expensive treatment requires noteworthy income, which leads to some connections between subject Beronis and some stormings on noble levels in upper hive levels. News came on a subject whose description matches Beronis, who was acting as a bodyguard for a noble household for some months. His sudden disappearance leads to the conclusion that his cover was blown up and had to look for shelter. Apart from the devices to avoid digital identification I mentioned in my latest report, I have been able to verify the use of electromarked contact lenses by the subject to avoid eye scans. The subject has got rid of expensive maintenance weapons or gear, which difficults following him. It is known that he uses a chainsword, probably his Imperial Guard regulation weapon. As per instructed, I have abstained of reporting the subject V. Prienne to the Inquisition, though an inquisitorial team has recently been deployed in the hive. Unable to obtain the name of the leading Inquisitor. Subject B. Beronis dwells at Level 42, West Framework, District 975. Non-qualified workers district, medium-high common crime rates. In addition of being reasonably unexpensive, it suits his purpose of staying under the radar. A cargo bay and a passenger transit bay ensure escape routes, so extreme caution is advised when approaching the subject. '...What led general Arveiron to take that decision, that we will never know. But the facts speak for themselves. After a long night of deliberations, his Staff looked bewildered, to say something. But the Space Marines command agreed too, so there was nothing else to say. After three weeks of skirmishes, we were allies to the Eldar of Saim-Hann now. We had been about six months in Biosnar, leading the offensive against the Orks our own way, and then it all suddenly changed. Those damn lankies had been on us and we were to fight aloingside them. Crazy stuff. But we were just but soldiers, and so is the nature of war. It took us most of the day moving the front line according to the new joint deployment. That was the first time we saw them properly. Cold, haughty, in their red and white armours. They mostly used jetbikes, which happened to be damn fast. As far as we could learn, they called themselves 'Wild Riders', and before the campaign came to an end, we could see the name was well chosen. They threw themselves recklessly against the Ork lines at high speed, causing mayhem. That was the only moment they allowed themselves to scream like crazy beasts. Apart from those moments, the Eldar were unnaturally silent. Every time we made a movement, a line redeployment, anything -differences were so obvious. Our riflemen companies marched singing battle cries, hymns, things of the like. Difficult to understand for anyone who has not served. Hundreds of voices trying to overlap the closest company. It was our way, and it still is, of cheering up each other, of evading from reality, of not thinking of the position where we are going to fight imminently. These old soldier things. But they... nothing. Not a sound. Not a single note, a song or anything. Not a groan from someone stumbling. Not that any of them ever stumbled on anything, of course. They walked strangely, effeminately, but the bastards did not ever stumble once on that damn rocky ground. They kept perfect formation at all times. They did not divert, did not slow down... Seriously, they were unnaturaly perfect. Stormtroopers. Those people are weird even for us, their own mates. They are always recruited among orphans, people with no families. They are oriented to service even from the Schola Progenium. I remember them having an Officer, a Captain, maybe a Major, who was a total beast. Sullen, stern, he kept them all at bay at all moment. He was good, even for the Stormtroopers, but he was hard to deal with. The same goes for a Commissar who accompanied them. Nobody knew for sure what was he doing with them. Vachakian, Bayakian or something like that was his name. The only decent bloke in that unit was a Sarge, I cannot remember his name. He talked to us sometimes, he even brought some combat ration packs a couple of times. He talked about campaigns here and there, he talked about Benserade, Vestris, Bellegard. Mythical places, or others we had never heard of. We always though he made up some stories, but on the whole he was a decent man. Then they sent the Stormtroopers behind enemy lines, alongside a few Wild Riders. They spent the rest of the campaign together, another six or seven months. They all came back heavily changed, those who came back at all. I never saw that Captain or Major speak again. The Commissar was out of combat, they had to evacuate him. Even the Sarge was taciturn. Some of our boys made some jokes about them being too long with the pointy ears, but they were in no mood for jokes. But we all noticed a totally unnatural ability of getting on in the last combats we shared with them. It was like some kind of crazy luck. They went out of a position for an assault and, ten seconds later, a barrel exploded just there. They chose a place for an ambush... the most valuable targets went right for them. During the final assault on the city of Hirtaco they disobeyed the command order of taking a sector; they infiltrated through other way. Well, their designated area blown away because of an ammo dump; but their action was smooth and they were who allowed the gates opening that facilitated the final offensive. I don't know, our friend the Sarge scarcely talked to us, he just babbled some thing about not being a conscious thing, it was just the way things happened. Some kind of 'gift' from the Eldar Farseer, some stupid thing about prophecies, a star to guide them, whatever. The thing is that after the campaign they all were through Inquisition scrutiny and they all were back to service. Sergeant Lambec Kersan, 4th Ecbatana Riflemen. A Tale of the Biosnar Campaign, by Someone who Was There, Chapter IX. I would love to hear your opinions on the whole story so far. You can consult Vol. 1 HERE. I had neglected this front for a while, just when I was on the verge of finishing it. Time to solve that! I honestly cannot remember in which scenario these are needed, but it's not like I need any excuse to paint some skellies! If you see the pic above and it doesn't ring any bell, don't worry, it's simply that you're too young for this blog. But again, the minis. The last batch is kind of tricky. There are four tokens in the game that are used for evolving characters. These are the villagers. Through the campaign they can become militiamen, and the tokens can eventually be used as guards or special characters as well. So these could serve as the multi-purpose minis we were needing. Given that the two last minis would represent civilians recently turned into militia or things of the like, I thought it could be convenient to use the same colours, though being clearly different clothing styles. It would give a sense of uniformity.